Netflix and chill? Sure…so long as it looks as inviting as this! 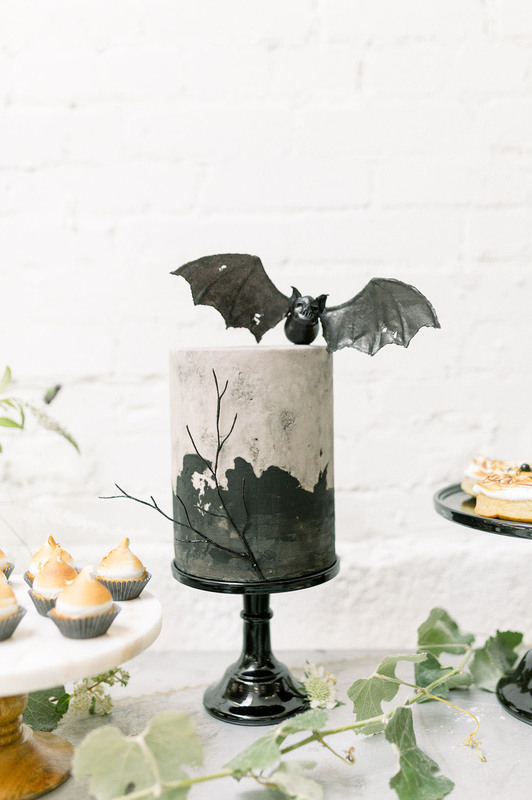 It’s the month of eerie fun and we are living for it! 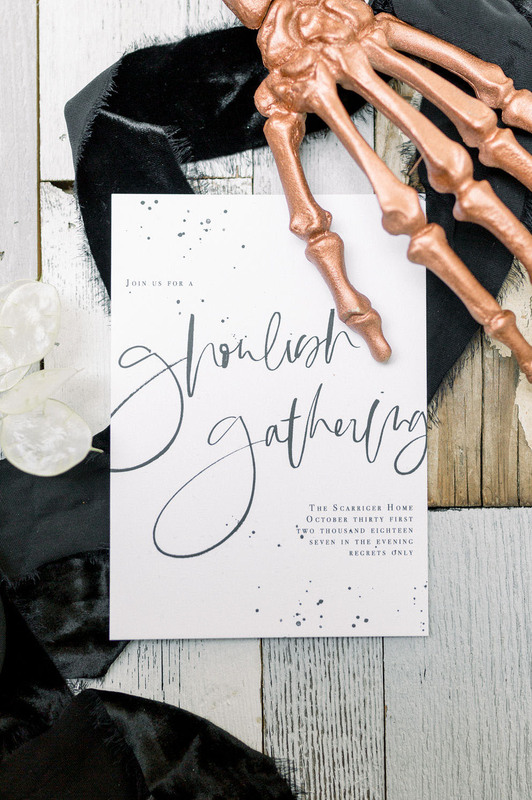 Parties, costumes, movies, candy—bring it on! 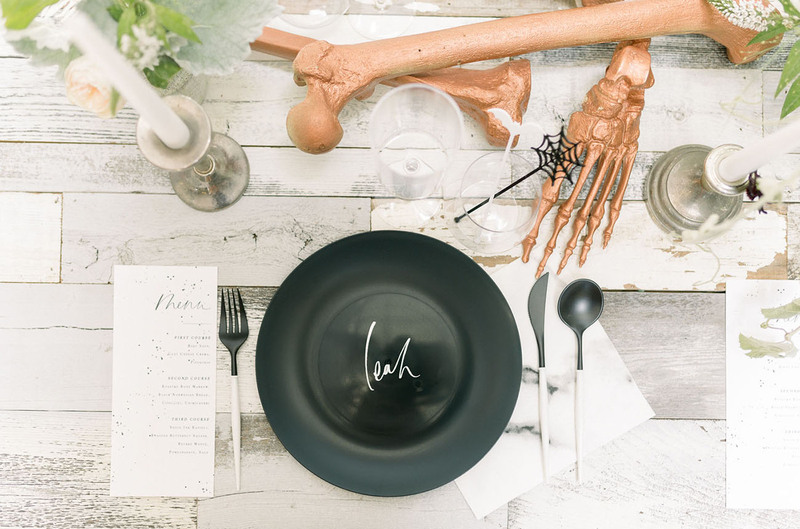 If your hellbent on throwing a ghoulish get-together but not so much into the traditional orange + black, today’s party inspiration might be exactly what you’re looking for. 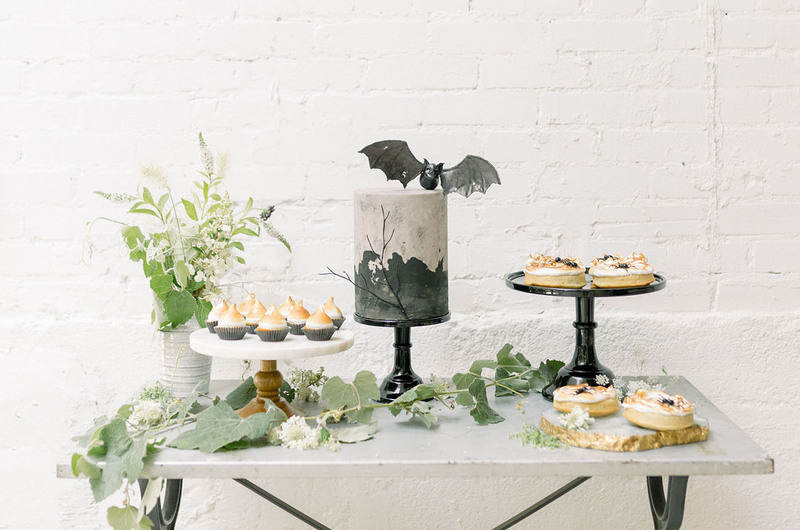 This spooky soirée is from the creative minds at Beijos Events, who designed a sophisticated (yet plenty frightful) setting at Sweet Salvage Rentals! 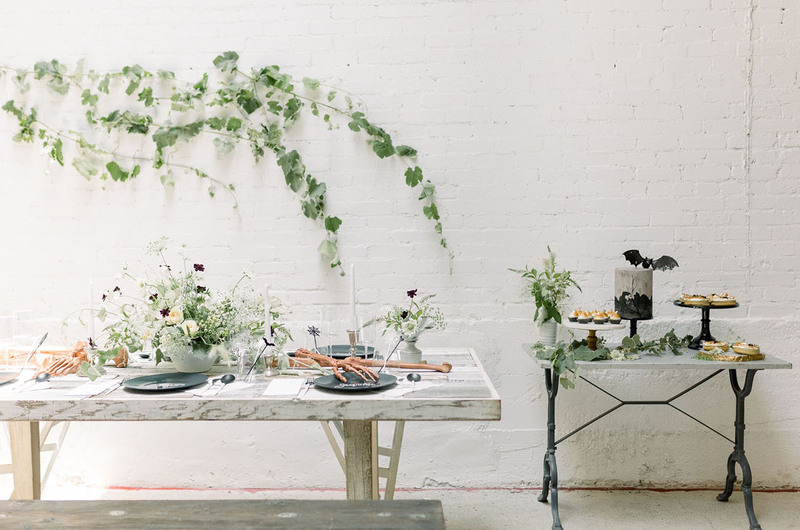 You’re invited to peruse the party below with photos from Dulcet Creative. 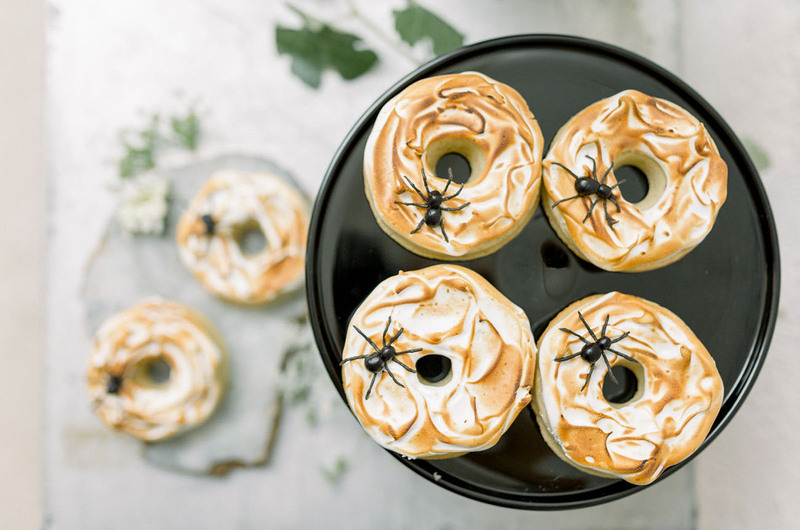 Hurry—a tantalizing treat awaits! 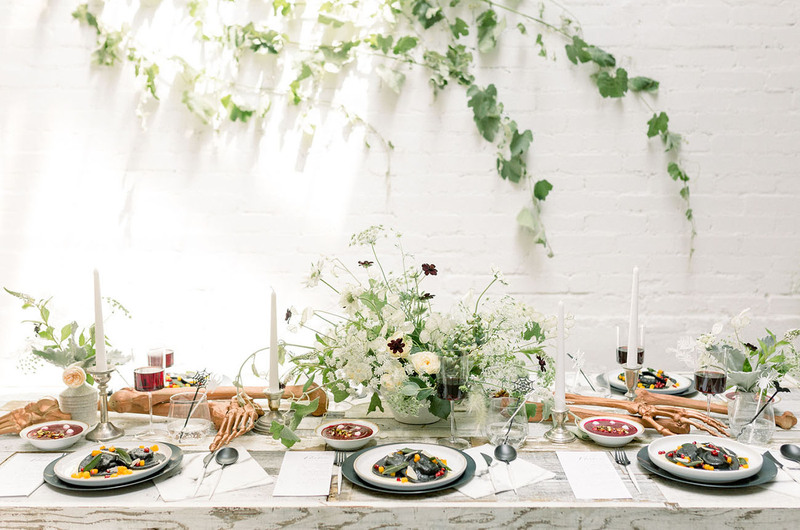 First up, no party is complete without florals (in our humble opinion), and the climbing vines with light + dark blooming pops are just right. 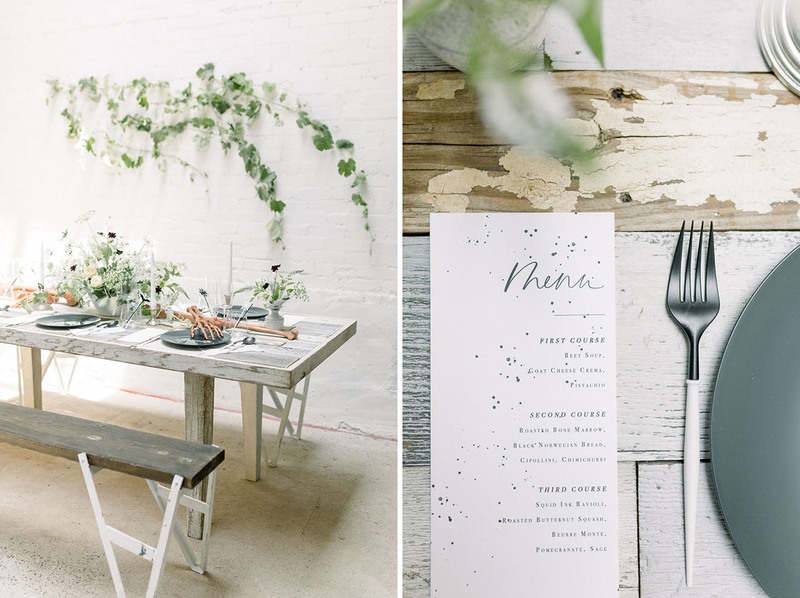 A Fabulous Fete designed a sophisticated menu and invitation with a splatter of mystery + intrigue! 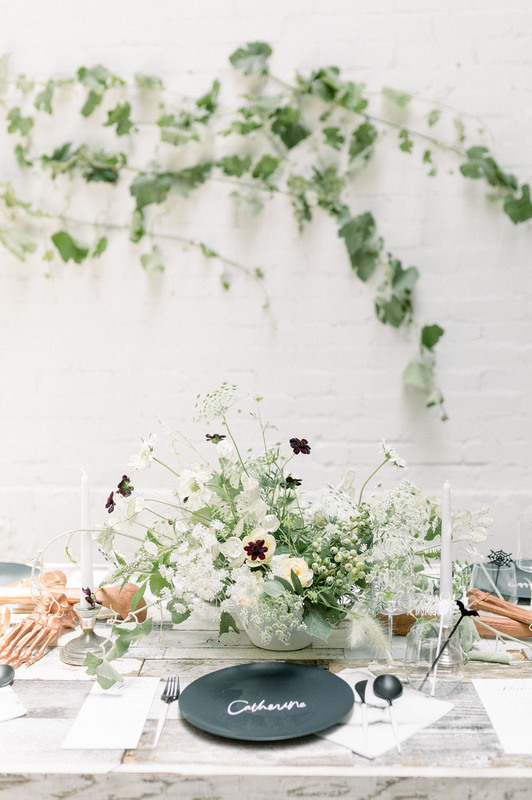 We’re bursting with love for the centerpiece by MV Florals! 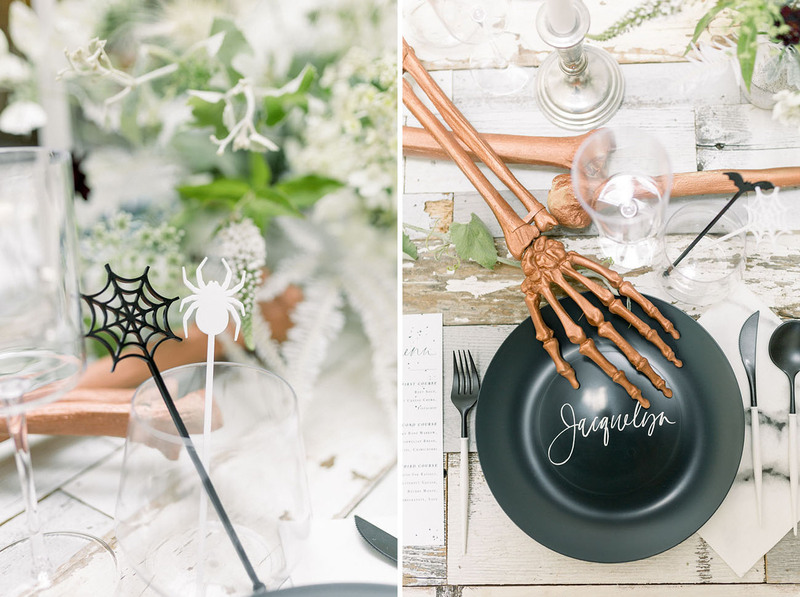 For a fun drink detail, it’s total Halloween swizzle stick perfection from The Roc Shop! 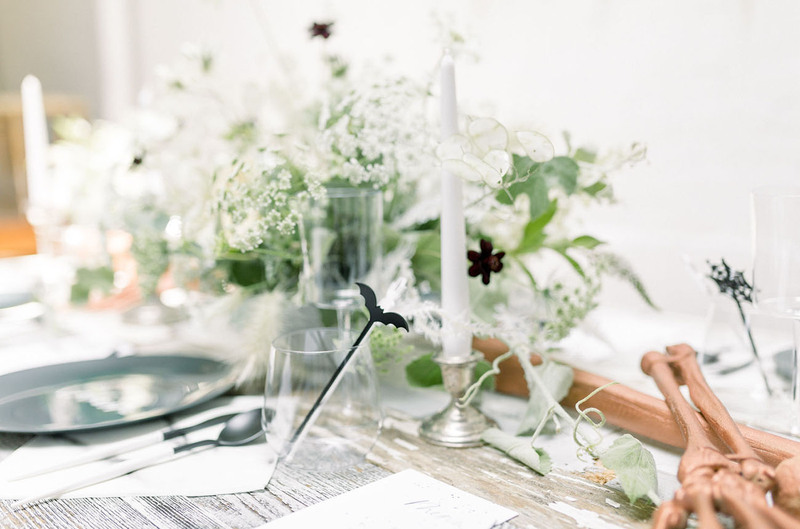 Hands off this dreamy place setting with calligraphy by A Fabulous Fete! 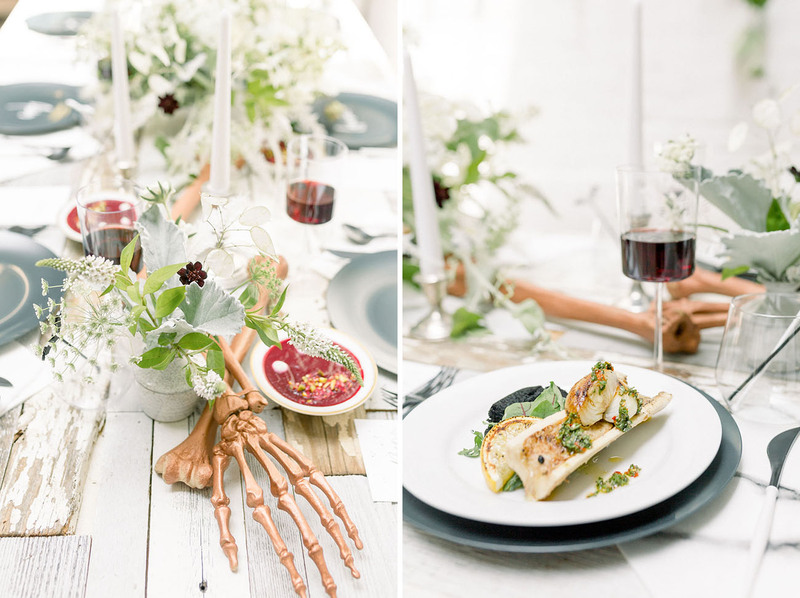 What do you serve at a sophisticated Halloween party? 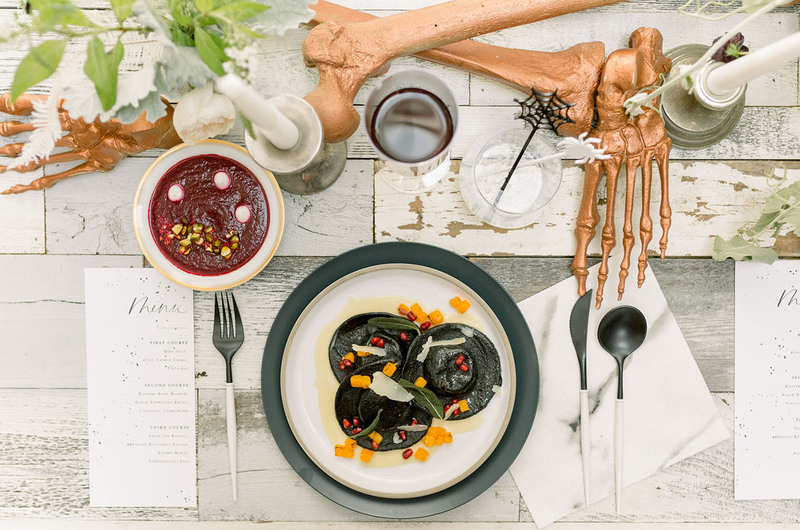 Colette’s Catering gets it right with blood-red beets, bone marrow, and black squid ink. Deliciously devilish! 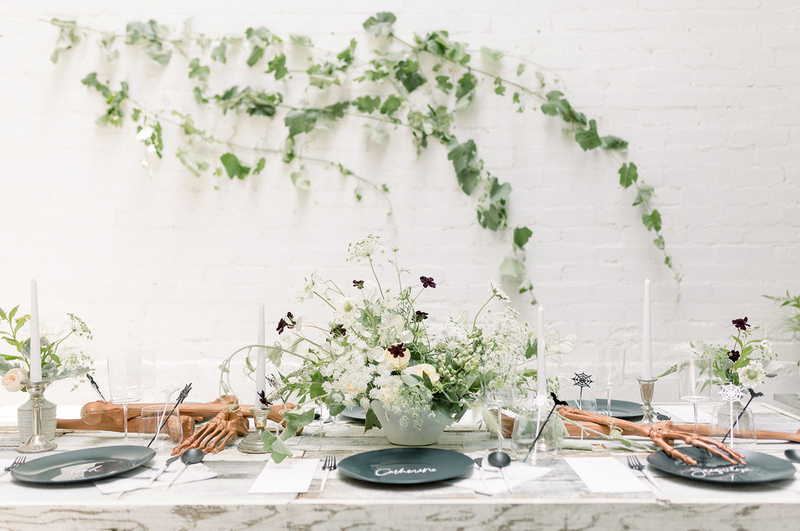 Let’s not forget the fine tableware from L’entramise! And for dessert? Delectable goodies from Sweet & Saucy Shop! 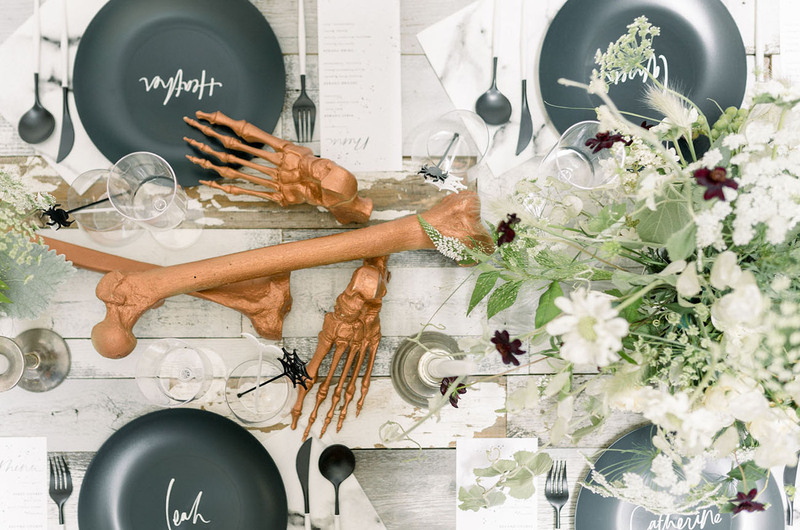 No bones about it, we’d die for an invitation to this party! Mwahaha!